What a thrilling final 25 minutes. Three goals and a sending off and a deserved win for West Brom, thanks to Jonny Evans' late, late winner. Thanks for your company. Follow all the reaction to today's games here. Chaos. We have two balls on the pitch as play restarts with a dropped ball...Rickie Lambert hoofts it away. The final additional minute being played... surely there is no coming back from this? And it leads to what's surely the winner! Played short initially and after it comes in, a spot of pin-ball in the six-yard box before Jonny Evans taps in his first goal for West Brom from two yards. Craig Gardner with half-chance for West Brom but he shoots straight at Jack Butland. West Brom must be wondering how they're in this position. Just before the equaliser, Rickie Lambert miscontrolled when he would have been clean through and could have made it 2-0. However, can they now take advantage of playing against 10 men? Changes for both teams. Saido Berahino is on for West Brom in place of Claudio Yacob, Charlie Adam comes on for Stoke, replacing Xherdan Shaqiri. No sooner are they level, Stoke are down to 10 men as Geoff Cameron is sent off for striking Claudio Yacob after a tackle between the two. They had two men dismissed in this fixture in August. Totally needless. Out of absolutely nowhere, Stoke are level. Joselu sends over a peach of a cross from the left with the outside of his right foot and Jonathan Walters heads the equaliser. A chance for James Morrison but his shot is straight at Stoke keeper Jack Butland. West Brom look more likely to extend their lead than Stoke to equalise. They have done virtually nothing in the second half. One of the most needless yellow cards you'll ever see. Stoke's Marko Arnautovic is repeatedly told to move away from a West Brom free-kick on halfway but continues to argue with referee Lee Mason. He just won't let it go and do as he's told. The resulting yellow card is inevitable and well deserved. Ridiculous. Goalscorer Stephane Sessegnon goes marauding down the left but Stoke skipper Ryan Shawcross finally stops him. Stoke then launch a rare attack but the ball is too hard for Jonathan Walters and runs out for a goal kick. Sums up their play at the moment. "It was a terrific finish from Stephane Sessegnon. He just elected to go for power and it flew into the back of the net. Stoke will do well to get back in this." Finally a corner from Stoke and it's a good delivery to the far post. Joselu gets up high and heads down but can't find a team-mate. Stoke not giving Boaz Myhill much to do so Jonathan Walters is on now, replacing Glenn Whelan. Not much of a response from Stoke so far. Tony Pulis has never lost when managing in this fixture. That record looks like being extended. The first change. Bojan has had a quiet afternoon and is replaced by Joselu, who scored his first goal for Stoke against Everton on Monday. Maybe Saido Berahino will have to sit down again. Darren Fletcher wins the ball, finds James Morrison and he plays in Stephane Sessegnon 12 yards out, right of the penalty area, and he smashes it past Jack Butland. A good move. A great finish. Saido Berahino is off the bench and warming up. It could soon be time for the West Brom striker, as Craig Gardner skies a first-time shot from the edge of the box for the home team. The Stoke attack is all coming down the right so far in the second half, and it was the source of Xherdan Shaqiri's chance. That's better. A neat triangle between Glen Johnson, Marko Arnautovic and Xherdan Shaqiri but the Swiss' shot rolls tamely straight to Boaz Myhill. He should have done more with that. Five minutes played of the second half and no improvement so far. The ball pinging between the sides with no structure and little skill. Both teams keep going down cul-de-sacs. The fans do their best to encourage an improvement but they are feeding off scraps. Bojan and Ibrahim Afellay get the second half under way for Stoke. No changes from either side. Come on, lads. Let's have something to get excited about. Stoke have enjoyed the better of the possession, and had seven shots to West Brom's five, but they have looked subdued so far. Glen Johnson had their best effort, which was pushed away by Boaz Myhill. Not much happening elsewhere in the Premier League either. West Ham beat Liverpool 2-0 in the early game but Sunderland are the only side to find the net so far in the 3pm kick-offs. They are playing Aston Villa. Is everyone sluggish from too much turkey? It started off well enough but, Darren Fletcher's miss aside, there was not a lot to report in the final 20 minutes of the first half. West Brom had the better openings but little in it in truth. The best opening so far and it falls to West Brom captain Darren Fletcher, right of the penalty area, 12 yards out. He has time and space but slices it wide, off the outside of his right boot. A bad miss. I can't even headline that 'close' because it was well off target. It's all very quiet and subdued at The Hawthorns, on and off the pitch. Craig Gardner looks for the run of Rickie Lambert but the ball skips off the slick pitch into Jack Butland's arms. That's about as exciting as it gets at the moment. An unusual one. A slight delay as Ryan Shawcross's captain's armband has split and won't stay on his body. He has to wear one, but referee Lee Mason allows him to stay on the pitch before a new one is supplied. On the pitch Stoke have four corners in quick succession but can't make them count. No they can't. Chris Brunt's delivery doesn't get past the near post and is easily cleared. Not much doing at the moment, neat passing but neither side threatening to open the scoring. Hang on, Erik Pieters concedes a corner to West Brom. Can they make anything of it? Marko Arnautovic has sight of goal but his shot from the right of the penalty area lacks oomph and is easily smothered by Boaz Myhill. Stoke spread the play from left to right and back again but West Brom, who kept a league-high 17 clean sheets in 2015, look secure and Mark Hughes' men are unable to get closer than 20 yards from goal. While West Brom's attack is fairly balanced, Stoke favoured the left-hand side in the opening 20 minutes within 43.2% of their attacks coming from that side. However, Bojan, Marko Arnautovic and Xherdan Shaqiri have been kept fairly quiet so far. Glen Johnson cuts in from the right and puts his laces though one with his left foot and Boaz Myhill has to stretch to make the save with Marko Arnautovic ducking in front of him. Excellent start from West Brom and Jonny Evans is in the thick of the action again, stretching to turn in Gareth McAuley's flick-on at the far post three yards out but he can't quite get enough on it. West Brom have another free-kick in an attacking position. It's swung in from the left and Jonny Evans can't quite get to it but claims he was pushed in the back by Geoff Cameron. The replay suggests he was. Needless from Cameron and lucky not to give away a pen. It takes seven minutes for Stoke's first attack and Glen Johnson's mis-hit cross is floating towards the roof of the net until Boaz Myhill tips it over. From the corner Geoff Cameron has two shots in quick succession but both are blocked. Stoke fans very optimistically shouting for hand-ball but referee Lee Mason rightly not interested. Erik Pieters fouls Stephane Sessegnon and gifts a free-kick to West Brom in a dangerous possession but Gareth McAuley and Jonny Evans get in each other's way eight yards out whent he ball comes over and Stoke clear. The Baggies messed that right up. West Brom make a positive start but an early long ball for Craig Gardner is just too strong and goes through to Jack Butland. Slippery conditions with this rain. A few early crosses might be in order to test the goalkeepers. You never know what is coming when you come to watch Stoke. But you know it is going to be entertaining. The Potters' attacking players have really started to shine with Bojan Krkic, Marko Arnautovic and Xherdan Shaqiri scoring five goals between them in the team's recent wins over Manchester United and Everton. They are a good, entertaining side - but they are up against a former manager in Tony Pulis who is coming into the game on the back of a gritty win over Newcastle. The Baggies will be missing striker Salomon Rondon and winger James McClean who are suspended after their red cards against Bournemouth on 20 December, but I fancy them to overturn Stoke. The players are in the tunnel. In keeping with the relentless rain we have experienced recently, it is absolutely chucking it down at The Hawthorns. West Bron's Saido Berahino continues to sit on the bench this afternoon, despite fellow striker Victor Anichebe being ruled out after injuring his hamstring late in Monday's 1-0 win over Newcastle. When Pulis spoke of "feeding off the crumbs", he explained that "we have to move people out before we can move people in". With Berahino recently told he was "lucky" to be on bench after "letting himself down at times", could he be one of those players "moved out"? Would that be a good move for all concerned? Get involved at #bbcfootball. West Brom boss Tony Pulis knows his opponents this afternoon as well as anyone, having managed Stoke for 10 years over two spells. Pulis celebrated his first anniversary in charge of The Hawthorns yesterday but didn't seem to be in the most jovial of moods. Asked about doing business in the January transfer window, he made sure he dampened expectations. In a big way. "We're sat on the top table but we feed off the crumbs," he said. "You have to understand that. You have to wait for those crumbs to drop off the table and that hopefully you're in the right place at the right time to pick them up. And that doesn't happen at the start of a meal. That usually happens at the end of the meal." Not much to get excited about there, Baggies fans. While Stoke scored twice within the last 10 minutes to win at Goodison on Monday, West Brom grabbed an important 1-0 win at home to Newcastle thanks to captain Darren Fletcher's header. It came after six league games without a victory and gave the 13th-placed Baggies some breathing space from the bottom three - six points now separates them from Newcastle in 18th. With Manchester United and Everton beaten in their past two matches, Mark Hughes has opted to stick with the same starting XI for the third match running. Xherdan Shaqiri, Bojan and Marko Arnautovic, who have linked up so brilliantly in recent matches, will again pose a huge attacking threat. Despite suggestions that Saido Berahino would start, the could-well-be-off-in-January West Brom striker remains on the bench. The Baggies make two changes from Monday's win over Newcastle as Victor Anichebe and Jonas Olsson miss out with hamstring injuries. Rickie Lambert and Craig Gardner come in. Stoke for the top four? Mark Hughes' side have come a long way since West Brom's 1-0 win at the Britannia Stadium in August. Three points from six games preceded 26 from their next 13 and Stoke - fresh from a thrilling 4-3 win at Everton - now sit ninth, just two points off fifth-placed Crystal Palace. Hughes is even fielding questions about potential Champions League qualification. His response? "Who knows where we can go?" The year of the Potters? Two men sent off within the first 30 minutes in an August defeat to West Brom as the season started with just three points from the first six league games... who could have envisaged how different it would look for Stoke at the dawn of 2016? Happy new year and welcome along to live text coverage of the in-form Potters' visit to The Hawthorns to face Tony Pulis' Baggies. 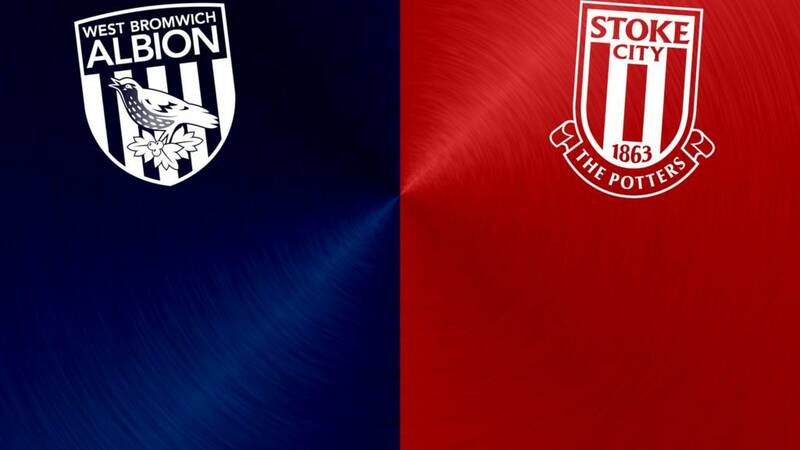 Welcome to our live page for West Bromwich Albion v Stoke City. We’ll have live text commentary here from 14:30 GMT. You can keep up to date with all the build-up to today’s games here.